Throughout the time that I’ve owned my $2500 2002 Subaru WRX, I (thankfully) never really experienced any major issues that prevented me from driving the car, for an extended period of time at least. This is the story of the first ‘major’ break down I experienced with the WRX. It was a Saturday in early November. My Grandmother was out of town and she asked if I could accompany my Grandfather to dinner, to which I willingly agreed. Knowing that my grandparents favor my friend Mathias to myself, I let him know that we were taking a trip to South Jersey for the dinner, and I began heading to Brooklyn from Soho to pick him up. However, before I could even make it across the bridge to Mathias, I found myself stranded in the middle of Chinatown unable to easily get the car into gear. While attempting to maneuver through the thin Chinatown alleyways (they call them “streets”), I suddenly lost clutch pedal pressure. I couldn’t get the car to engage a gear without grinding. Once I found a spot big enough for the WRX on the street, I solely pushed the car in and began diagnosing the problem. It was obviously a clutch issue but there were no clear signs of a fluid leak from the top of the engine bay. The clutch fluid reservoir appeared to have been overfilled by the previous owner, and I couldn’t find where there were any fluid leaks or ripped hoses. Without starting the car, I began to troubleshoot by pumping the clutch pedal to build pressure, but nothing. About fifteen minutes had passed and I phoned Mathias to let him know what happened and where I was, and AAA to arrange a tow. I decided to check underneath the car for any signs of fluid drippage, and sure enough there was a small puddle of DOT3 Brake Fluid. Unfortunately, I still couldn’t find the source of the leak, but at least I had some sense that it wasn’t some sort of catastrophic failure. Then came the worst part of the day. I had to call my Grandfather to let him know that Mathias and I wouldn’t be able to make it to dinner. 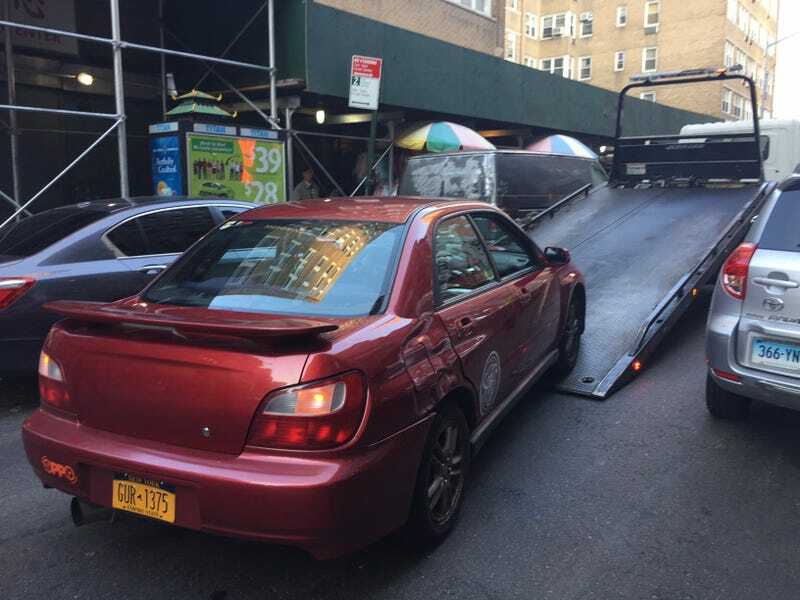 I arranged to have the Subaru towed to my family’s property in New Jersey, where Mathias and I would have access to some tools and another car. Just minutes after Mathias arrived and I was able to explain what happened, he was able to find the source of the leak and complete the diagnoses of the issue. The Subaru had a frayed clutch line which appeared to go from the master cylinder to the slave cylinder. By the time the car was off the tow truck in New Jersey, it was way too late to attempt to source a replacement clutch line. And for those of you that are unfamiliar with that part, just look at it! Have you seen something like that at your local Pepzone or Advanced STS Autoboys? I don’t even understand how fluid flows through that. Luckily enough, Mathias and I had a well established relationship with a family of Porsche 944 enthusiasts, who were later converted to Subaru enthusiasts. And they even live near my grandparents! This not only meant that we would probably be able to fix the car quickly, but I wouldn’t have to completely let my Grandfather down because we would be able to have dinner with him before acquiring the part. I confirmed with our friend (Mathias and I like to refer to him as ‘Subro Supreme’) that he had the part, we ‘borrowed’ my mother’s 2005 Ford Freestar, and Mathias and I were off to dinner with my Grandfather. When we arrived at my grandparent’s house, Mathias was greeted with love and favoritism, while I was greeted with a well-earned, stern look of disappointment. Nevertheless, we had a lovely meal at the Americana Diner of Shrewsbury, which my grandparents are regulars at, and then departed to acquire the clutch cable from Subro Supreme. The only other supply needed was brake fluid, which was easily accessible thanks to a WalMart. It was at this point that Mathias and I realized we had messed up. Once back with the Subaru, it probably didn’t even take a minute to get the ripped clutch line off and the new one on, but it seemed to take an eternity to get the pedal pressure somewhat drivable. Now, don’t get me wrong, I’ve been the pedal pusher in many cars when bleeding brakes or clutches in my former position at the Classic Car Club of Manhattan, but there always seems to be some sort of finesse that neither Mathias nor myself can reproduce when doing it on our own time. This usually resorts in me yelling at Mathias in an attempt to teach him how to properly release the bleeder valve and tell me when to press the clutch, while Mathias gets sprayed with some fresh DOT3. Have you ever tried to explain to your girlfriend why the car you bought a week and a half ago fell apart in the middle of Chinatown and you had to cancel your evening plans because you already pushed your grandfather’s dinner back three hours and you were then going to attempt to quickfix car problem and possibly be back in time for your plans with her but it didn’t end up happening? And you didn’t answer any of her texts because you were trying to fix the car ASAP and didn’t want to let her down? What? Yes? Oh, I thought I was the only one. The moral of the story is this. If you’re daily driving a car with over 250,000 miles, don’t be surprised when it breaks. Just be ready to react.